Handwriting is on my mind again (see my previous post: Handwriting Apps) as summer has started and my children and I have 'appointments' together each day to work on some skills. For my older boys, it's math facts and reading and writing. For my 4 year old daughter, it's beginning writing and reading instruction. The other day she was drawing a picture of her dance class friends and she wrote the names (copied off of a name chart I made) and I took dictation. She is in the 'strings of letters' writing stage. I believe children learn letters when they have meaning, so I always start focusing on letters in names. 'Look, Jessie and Brianna and Lily all have an i!' 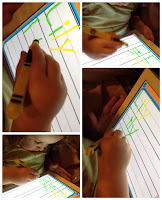 While she was attempting her 's' I was thinking about the apps I've used in class for handwriting skill practice and I decided to hunt to see if there are any new additions... I found one on my iPad that I had downloaded and not used yet, and another was mentioned on Apps for Children with Special Needs (a4cwsn) and another I downloaded the other day when it was free (I think I saw it mentioned on Facebook or Twitter). Be sure to read over my previous post about finding free apps. Finding a good, inexpensive app can be time consuming. There are lots of apps out there and not all are worth the space on your iDevice or cost. In my opinion, a good app has to be better than the traditional pencil/paper handwriting book. It should TEACH, MOTIVATE/be FUN, and offer FEEDBACK. The ability to adjust the difficulty level is important. One feature I wish all handwriting apps included is the phonics connections. Say the letter/sound as the child is tracing please! I found Ready to Print, $9.99- iPad only- off a4cwsn.com and was intrigued by the 'prewriting' activities to help develop fine motor skills, as well as the feature of tracing the letter and then writing it on your own. I requested a code (my iTunes balance is down to pennies now!) and they sent me one to try it out. It has 8 activities plus a free draw option. Within each activity there are settings to make it easy or challenging (large or small letters, wide or narrow tracing lines) I would recommend this app for 2-6 year olds as it is great for beginning concepts of printing and good practive of actual writing. The cost is pretty high for an app I would recommend (especially for the classroom). However, in perspective, a workbook would cost the same- doesn't give support and is a throw away after used... so in my opinion, it's certainly worth considering. I will make a few suggestions for their next updates to the developers but this is a really great app already. In picture 1 and 2, the student uses two fingers to pinch the primary colors together to make a tertiary color (or put a spider in a web). 3 shows the touch/tap with index finger to 'crack' eggs (and other cute actions). 4 has students visually discriminate and match shapes. 5 demonstrates the ability to track student progress- there can be at least two users- (no personal information other than name is collected) and 6 shows setting options. There is the option to 'lock' the settings so user information can't be erased. Additionally, there is a 'disappearing back button option' so students have to progress through levels without quitting after one or two). One of the best features of the app in my opinion, is the trace/then write option. First the child stars where an arrow points and goes to the black dot. If you stay in the line you get a higher accuracy score. Then, on the right the child is encouraged to draw the line/letter they just practiced with help. I did find it difficult to know where to begin again after making a mistake. The sensor seemed a little touchy and was occasionally frustrating, The developer has made several versions so I imaging/hope they will keep tweaking the app. My suggestion is to add support/hints when a student pauses, or they are not accurate on where to start and which direction to go. Little Writer, FREE is created by Innovative Apps (Grasshopper/AlligatorApps) and I always like their CUSTOMIZABLE apps. This app is no exception and is a really good free writing app (hint: go get it!). It works on iPad/iPod/iPhone. It has a simple homepage and options to write uppercase or lowercase letters, numbers, shapes and words. Best part- you can add your own pictures/words for your child/students to trace. As you trace it says the letter name, (love that as my students are still learning letter names). The only other app I've found that allows you to add your own words and have feedback/instruction is Write My Name $1.99, which I wrote about in the other handwriting post. Perhaps you worry about kids learning letters using finger tips rather than pencil grips- I say don't! You can make your own conductive iPad pens using old markers, conductive wire, conductive sponges and duct tape. See my instructions, below from an earlier post. I hadn't seen or heard of a sturdy, inexpensive stylus last fall so I made my own! My students use them for writing with the iPad. Link to blog post about making your own home-made, cheap, durable stylus. If you're not big on DIY projects, there is a better looking, sturdy, and inexpensive option available now- the AppCrayon might be for you. The shape of the AppCrayon is a gentle triangle, perfect for training youngsters into using the correct pencil grip. Yes these are few good thing which attracted me a lot. I love reading your blog!!! In April I received 25 iPads for my K/1 classroom (due to an AMAZING grant from my district). I purchased AppCrayons and loved them. They now have a free app for handwriting that is good. (I just checked and the AppCrayon app is still free.) Another handwriting app that my students love is Touch and Write. I got it free, but now it's $2.99. Thank you for all the information you give us! !